So when NailStuff.ca sent me these Valentine's Water Decals, I was so relieved because they just make it so much more convenient. I don't really have to do a ton of work. They're water decals, so all you have to do is cut out the design you want, place it in water & then once the design separates from the paper back, you're good to go. You just gotta stick it on the nail, wait a minute or two to dry, then apply a top coat. Their also extremely affordable, they retail on the website for $3.49. The designs in this set are gorgeous there's a few love text, there's some kittens, two people kissing, cupid, roses, kittens with a love potion, birds, etc. Loves of hearts, pink & red. Can I just say how much I am in love with this website, it's Canadian based, that offers free shipping within Canada over $29.00. Which is amazing because we truly do need more Canadian based nail polish/art websites. Most of the ones we do have are for licensed professionals only. 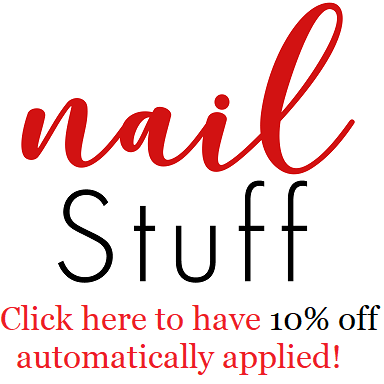 I'm not 100% sure, but I believe this make NailStuff.ca the 3rd nail related (that's open to the general public) based in Canada? Anyways, we all appreciate it. Don't forget to also "like" their Nailstuff.ca facebook page! Valentines Day is something that has become big in Sweden just recent years, so it's nothing that we actually are used to celebrate. But I do like making pretty manicures for it.